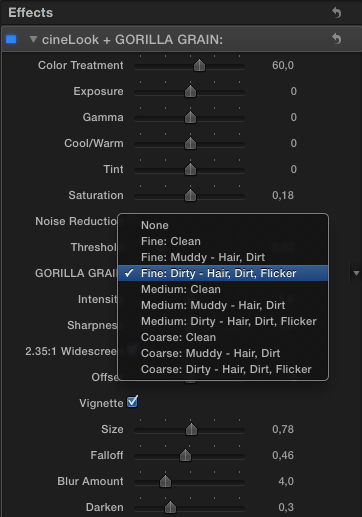 Denver Riddle von ColorGradingCentral überrascht heute mit einem Update seines erst kürzlich erschienen cineLook Plug-Ins für Final Cut Pro X.
Das Plug-In wurde durch Gorilla Grain aufgewertet und enthält nun neben Grading Presets und der Widescreen-Maske auch die Möglichkeit, die hervorragenden Features von Gorilla Grain zu nutzen. Hierbei handelt es sich um 9 hochwertige, echte Scans von echtem Filmkorn mit unterschiedlichen Intensitäten bei Körnung, Hair, Dirt und Flicker. Enthalten sind in dieser Version die 1080p-Scans in h.264. Das cineLook-Plug-In kann hier bei ColorGradingCentral direkt erworben werden und kostet inkl. Gorilla Grain 99$, also ca. 76€, und 69$ (ca. 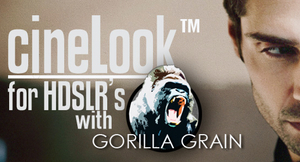 53€) für die Version ohne Gorilla Grain. Für alle, die cineLook bereits besitzen gibt es einen Rabatt-Code per e-mail. Beispielvideos gibt es auf den Seiten von CGC und GG direkt zu sehen. Viel Spaß beim Ausprobieren! Randy, great job with FCP. We’re #1. Now for a question: what relaly differentiates it from PP and Avid, and even film? Nothing? Well, if you had a blank slate, what would you do? Amongst other things, a modern blank slate wouldn’t look backwards to tape.I sometimes think Steve Jobs sees himself as the driver of the Merry Pranksters bus (Google it). He’s the driver and we’re coming along for the ride. One way or the other, though, he has been at the forefront of technological innovation since the 70s.If anyone but Apple had brought out FCP X, or if Apple had brought it out instead of Final Cut 1.0 back in 2000 (although it probably would have tape capabilities), then it would forever be an also-ran. However, right here, right now, I reckon it’s got legs.I must say, however, that I’m a little disappointed that you have divided the editing world into consumers and professionals where the professionals are editors who work at the BBC/big post production houses. I know you didn’t mean it.